WAN accelerators are optional components that can be deployed at the service provider to improve bandwidth utilization of remote backups and replicas sent by customers. Even if any Veeam Cloud Connect operation can be executed without WAN accelerators, WAN accelerators become useful components for a service providers willing to offer remote backup or replication services to customers with low bandwidth. WAN accelerators are enabled in the Veeam Cloud Connect license given to service providers without need for further licensing, so there is no licensing concern for the service provider when deploying them. In addition, starting from Veeam Backup & Replication v9.0, when the target of a job is Veeam Cloud Connect, customers using the Enterprise license are entitled to use WAN acceleration, while previously they had to have an Enterprise Plus license (and it&apos;s still like this in v9.x for jobs not involving Veeam Cloud Connect). WAN accelerators at the service provider sit between cloud gateways and repositories (for backup and backup copy jobs) or proxies (for replica jobs). They help improve the bandwidth utilization by caching blocks internally, avoiding the need to transmit every block over the wire. WAN accelerator is a windows service, so the best platform is a modern 64-bit OS like Windows 2016. The same design considerations made for local Veeam Backup & Replication deployments can be applied also in a Veeam Cloud Connect scenario when it comes to WAN accelerators: 8 GB of RAM at least, a fast disk for the cache (a SSD disk or SSD-backed volume is not mandatory, but highly suggested), and the correct sizing for the cache itself. In addition to the global cache configured during its deployment, a WAN accelerator consumes 20 GB per 1 TB of source data. A good choice is to use a dedicated volume for caching, so when it is filled, it does not create problems for the Windows OS and its running services. A single WAN accelerator can saturate links up to 150 Mbps on average, depending on the workload. However, some users choose to use WAN acceleration on much faster links in order to optimize bandwidth consumption of a shared WAN link. If bandwidth consumption is not a concern, using direct transfer mode usually achieves a better data transfer performance and a shorter job completion time on faster links. When a service provider configures a new cloud repository for a customer and assigns a WAN accelerator, this relationship is fixed. Even if a service provider has multiple WAN accelerators, only one is used for a given cloud repository, until this configuration is changed. So, when adding new customers or assigning new resources, a service provider will need to balance the assignment of WAN accelerators to customers manually. When sharing one WAN accelerator among multiple customers, a service provider will have to take into account the total bandwidth of the customers and the expected storage consumption for the cache. For example, one WAN accelerator with a 50-Mbits bandwidth could be the target of five customers having each a 10-Mbits upload speed. Experience in several environments suggests that the maximum ratio for sharing a WAN accelerator should be 5:1, that is no more than 5 tenants should be connected to the same WAN acceletor. Additionally, you should always take into account the failure domain: the more tenants that are connected to the same WAN accelerator, the more that are affected when one of WAN accelerator is not available. For all these reasons, ideally a WAN accelerator should be offered in a 1:1 ratio as an additional/premium option to customers using it. Ports 6160, 6162 and 6164 need to be open towards the Veeam Backup & Replication server controlling the WAN accelerator. There are also communications between the different WAN accelerators (source and target) happening over port 6164 (the controlling port for RPC calls) and 6165 (data transfer between WAN accelerators). This last communication is tunneled by the cloud gateway. Finally, ports 2500 to 5000 need to be open between WAN accelerators and backup repositories for data transfers of WAN-accelerated jobs. From a protection standpoint, WAN accelerators need to be protected properly. A backup job that is WAN accelerated cannot failover to a direct connection if the WAN accelerator fails. The job itself fails until the WAN accelerator is restored or the job is reconfigured for direct mode, and this needs to be done at both ends (service provider and customer). For this reason, having WAN accelerators hosted as virtual machines on a hypervisor with High Availability capabilities is a best practice. 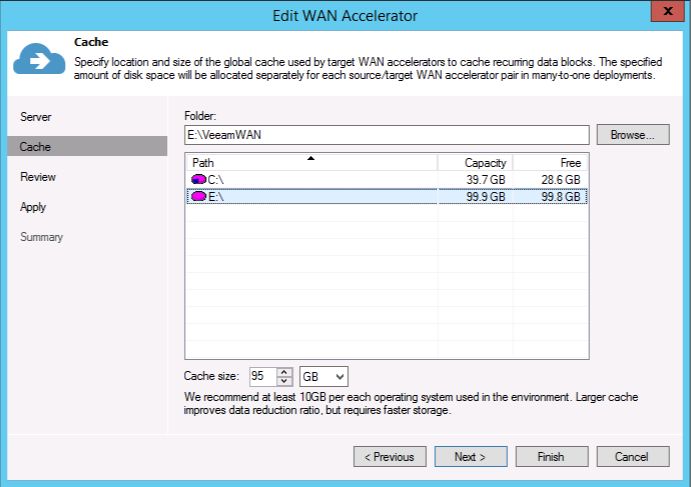 There is no need to back up a WAN accelerator because its cache can be populated from scratch when it is redeployed. In order to avoid low performance while the cache is warming up after a redeployment, the service provider can warm the cache before placing the new WAN accelerator into production.